Seattle Mayor Jenny Durkan will ask city departments to trim their budgets by 2 to 5 percent for next year. She hinted at the plan in a speech last month. Seattle Mayor Jenny Durkan will ask the city’s departments to trim their budgets by 2 to 5 percent for next year. The city has created new programs with unsustainable revenue sources, she said Tuesday, calling for cuts not in hard times but amid a roaring, tech-fueled economy. “Our significant economic growth has allowed us to increase our spending in recent years,” she said in that speech. The mayor was more specific Tuesday in her interview with KUOW. “We’re going to be asking every one of our departments to submit a budget that is between 5 and 10 percent less,” she said, promising that the city’s public-safety agencies would see the smallest trims. After the interview, a Durkan spokeswoman, Stephanie Formas, said the mayor misspoke. The plan is to request general-fund cuts of 2 to 5 percent. “As she committed during the campaign, Mayor Durkan wants to scrub the budget to find cost savings and efficiencies within each department,” Formas said, noting Durkan also has asked city employees to submit ideas for saving money. Revenue projections for 2019 aren’t yet available, she said. Mike McGinn ordered significant reductions as mayor. In 2011, when Seattle was struggling to pull out of the Great Recession, he proposed cuts of 1 to 5 percent for the police and fire departments, 5 to 10 percent for human-services and 9.5 to 14.5 percent for other agencies. The city’s 2018 budget was mostly put together under Mayor Ed Murray, who resigned in September amid child sexual-abuse allegations. Tim Burgess finalized Murray’s proposal during his short stint as mayor last fall, and the City Council made some changes before adopting the budget in November. It totals about $5.6 billion, including $1.3 billion in general-fund appropriations. Were Durkan to cut the budget, she would be moving in a different direction after years of increases in city spending — mostly under Murray. Seattle’s budget was about $3.9 billion in 2012, with $910 million in general-fund appropriations. Almost every city department increased spending between then and 2016, as public-safety costs soared by $100 million and transportation costs doubled. While Seattle’s population grew by 11 percent, the city’s total government expenditures grew 28 percent. Inflation in the area was 6.8 percent during that time. Paying for the expansion was relatively easy, with a building boom and a series of voter-approved ballot measures powering a 35 percent surge in tax revenue. Officials expect construction activity to slow, and some leaders have expressed concern about relying on ever-larger property-tax levies to sustain Seattle’s spending. On Tuesday, she cast a critical eye on past practices. “Part of the problem is that we’ve put in place new programs with one-time money,” the mayor said in the interview with KUOW, not mentioning any specific programs. Durkan stopped short of slamming Murray. The city’s Families and Education Levy is up for renewal this year, and two Seattle schools levies will be up for renewal early next year, she acknowledged. 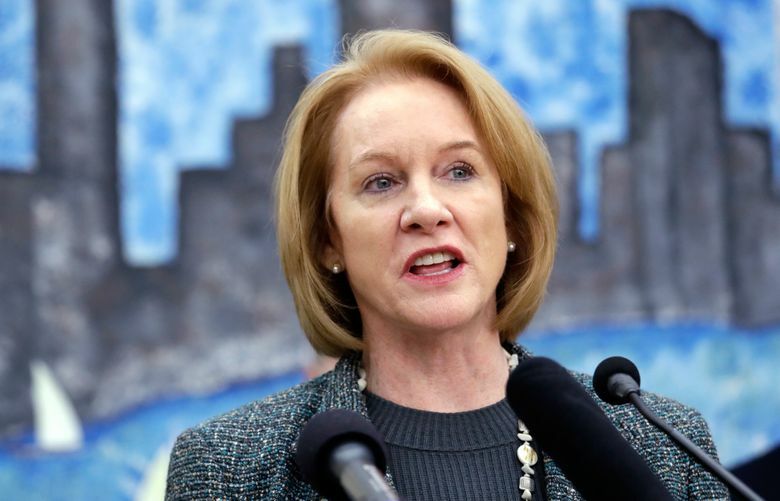 “We have to be very careful when we scope those levies to make sure the people being asked to pay for these services can afford to stay in the city,” Durkan said. Asked about an additional business tax under consideration by the City Council, Durkan was noncommittal, saying she wants to see more details. A council task force has recommended a $75 million-per-year tax aimed at larger businesses, such as Amazon. The money would be used to combat homelessness. “We have to be really careful not to have a bad impact on our small businesses,” Durkan said.